A major biopharmaceutical manufacturer selected Steam-Thru Connections as part of their down-stream tangential flow filtration (TFF) system out of concern for maintaining process sterility. Their specific technology consists of two-layer microspheres composed of biopolymers that are about the same size as red blood cells. 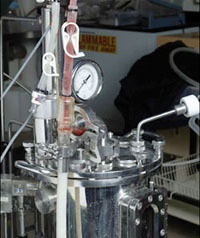 This size creates a serious problem for downstream processing; unlike therapeutic proteins, once the bioSpheres are assembled, they cannot undergo any sterile filtration steps at 0.1 to 0.2 μm. This required the downstream engineers to design a sterilely robust process system. Integrating single-use systems into the microfiltration TFF process can help manufacturers streamline process steps, reduce cleaning and validation while providing the assurance of a completely sterile Tff loop.